The Arctic – one of the most fascinating and remote regions in Europe. 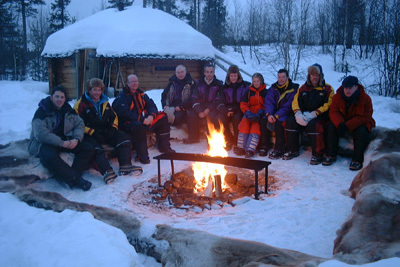 Leave behind the rat race and let us take you inside the Arctic Circle on a unique adventure aboard your very own snowmobile. This unique experience also includes Husky Sledding, plus An overnight at the famous Ice Igloo Hotel where everything (including the hotel itself) is carved from pure ice! Your adventure begins 200km North of the Arctic Circle where between December and April, the winter sky is lit up by the magical Aurora Borealis (Northern Lights). This is the location for the incredible Ice Hotel. Built each year from thousands of blocks of ice carved from the frozen river this is probably the most unique hotel in the world. At over 3000 sq metres it is certainly the world’s largest igloo. Of course the hotel also offers a swimming pool (for the really brave). Alongside the sauna cabin; a section of river ice has been removed to provide a pool. All you do is nip out of the sauna and dive into the almost frozen river pool….. 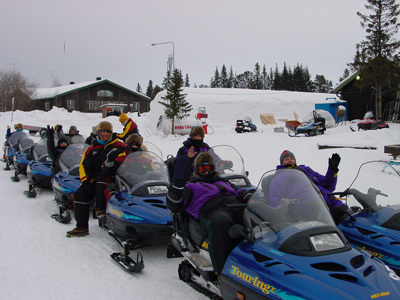 The highlight of the trip is the snowmobile safari. Riding your own machine and following one of the professional local racers who is also an expert guide you will be running though virgin wilderness. There are no tracks here or signposts. With acceleration akin to a motorbike these vehicles are amazing fun and are capable of speeds of up to 120kph. 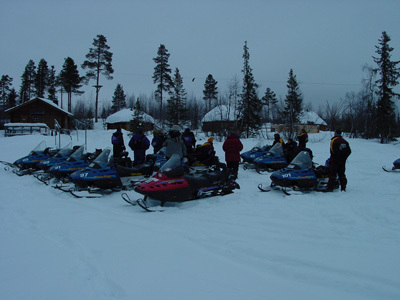 The ride will take the group over frozen lakes and open plains as well as through dense forest. Depending on conditions and the weather you could be riding between 70-100 kms on the round trip. Breaks will be taken along the way before reaching the remote wilderness camp and overnight base. You will be amazed at the complete and eerie silence – no birds, no aircraft, no roads and no traffic you really are in another world. Add in a Husky dog sled ride, a night in the Ice Hotel where even the beds are carved from ice, an evening in the frozen Absolut Bar and this is one tour you will not forget.